Posts are bite-sized pieces of information created by you or other members of your project team. They can be as simple as a photo and a few words or can contain as much detail as necessary to describe a complex jobsite issue. Once posted, they will live in your project Feed and can be viewed and responded to by you or others who are shared on the post. "Just in case" - documenting something so it's on record - possibly for a daily report or a potential problem. Something needs to get done - it's easy to assign posts to yourself, other users, companies and even email addresses. Something is wrong - document it, assign it, get it fixed. Fieldlens posts create a true audit trail of your project communication - each post and all additions to it are timestamped and all edits are included in the timeline. Posts can include pictures, video, marked up plans and more. Who sees your posts is up to you: who you've included in the Send to field at the top, and who you have assigned the post to. Your first post will default to include users from your company that are on the job with you. Within a project, tap the New Post button at the bottom of your mobile Feed, or click it from the top right of the web app. Within the create form you'll select what information to include and who will see your post. By default your first post will be sent to others from your company that are on the job with you. Tap "My company" to include other people or companies, or to make it private to yourself. You can also type in an email address to email this content to someone outside of Fieldlens. Their replies to the email will post back into Fieldlens. Note: After your first post, "Send to" will default to the previous post's selection - making it easy if you're creating a number of posts that need to be sent to the same people. Be sure to always check you've included the right people! Use the title to summarize the issue - along with any photos, the title will be prominently displayed within the Feed. The description can be used to more fully describe what you're seeing. A title is required. However, if you add a category and leave the title field blank, the category will become your title. Likewise, if you include pictures or video but no title, the title will autopopulate with See attached media. At the bottom of the create form, you'll see icons on your mobile device for frequently used options. 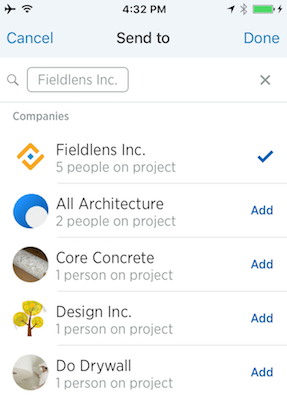 Add an assignee (or multiple) - If your post is about work that needs to get done, tap the assignee icon. You can set a due date for the task - if the same for all assignees - or different due dates for individual assignees. Add a safety or deficiency flag. Add a RFI or Submittal flag - Important Note: This is only available on projects created after 1/16/2018. Add a category - Easily identify and group similar posts together. You can filter your Feed to get a quick view of them and send reports when needed. Pin your post to a drawing or add a location. Add pictures and video - Take or attach unlimited photos and video and add them to your posts. After adding a photo to your post, you can use the markup tool to call out any details that need extra attention - just tap the photo in the post to launch the markup. Drawing Markup - You can add markup to a project plan from your mobile device while creating or reacting to a post. This markup will not be on the actual drawing but a snapshot of it that will be included with the post. Weather - Add current weather based on your project’s location and adjust as needed. Weather will be pulled by your project’s zip code. Resource Tracking - Select from lists of resources to enter workers and hours worked. You can also log unit codes associated with work done and track headcount for companies and disciplines. Attachments - Attach unlimited documents or other posts from programs like Dropbox, Google Drive, etc. Voice Notes - When you’d rather create a hands-free post, you can use the Voice Notes feature. Post & copy - After you post, this option will start a new post with the same people, categories, assignees and location. Auto-add weather - this option will automatically include the weather for all new posts on the current project. Open - assigned work that has not been completed. Resolved - the person responsible for the work has indicated they are finished. Closed - work has been confirmed as completed. Assigned posts that include a due date can also be marked as Past Due if they have not been marked Resolved by the due date. 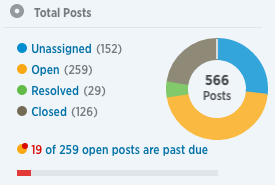 Posts that do not require work to be done - a progress photo post for example - are called unassigned posts. Unassigned posts require no action and have no assignees. If you make a mistake while posting, or a post is invalid for another reason, you can mark your own posts as Void from the web app. These posts are removed from the project Feed but can still be accessed via the filters on the web.